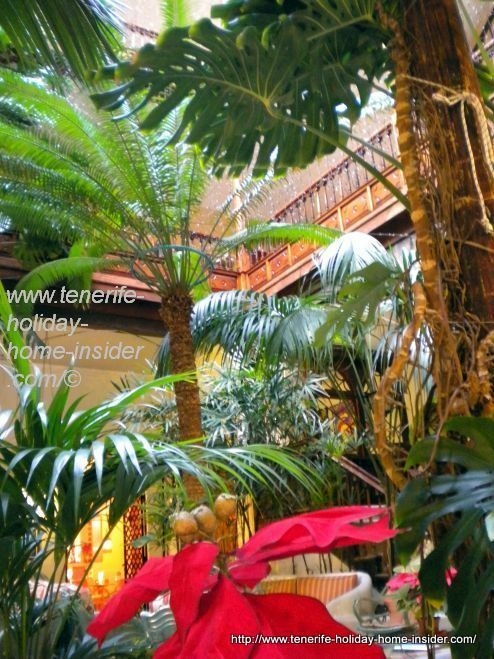 Why so many recommend the historic Hotel Monopol in Tenerife. Walk right in by the historic Hotel Monopol. Or take its colorful wheelchair by its front door to give your partner, friend or relative the tour of a charming town... You have to stay there, of course. The past of the historic hotel Hotel Monopol. 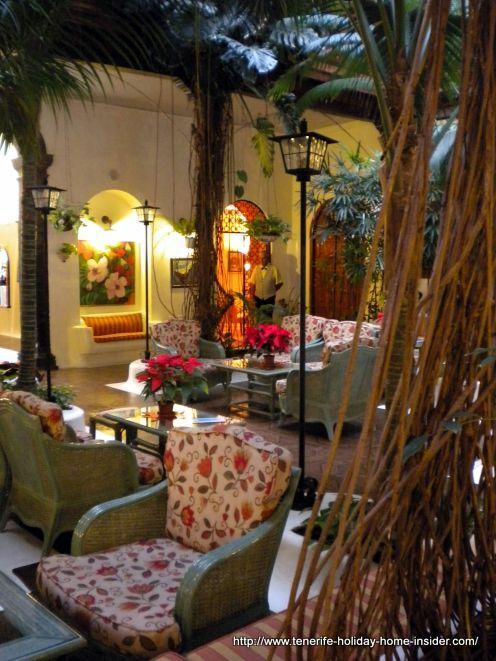 The Hotel Monopol of the oldest Tenerife resort is not a prototype for the history of Puerto de la Cruz. It's old enough though, as its first walls were constructed around 1544. 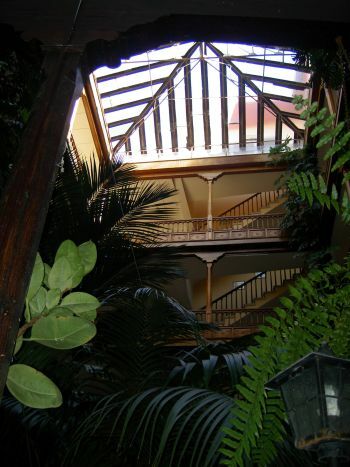 Many would say, that the Hotel where a Marquesa lived or Hotel Taoro which closed doors in Parque Taoro a long time ago, were more important during the past of the oldest Tenerife resort. 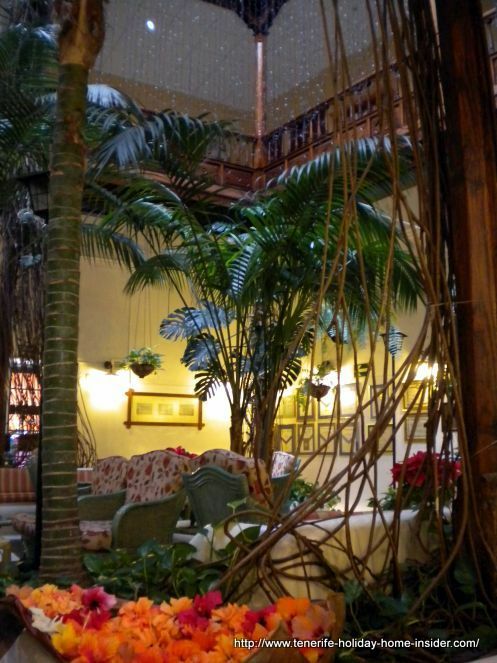 Anyway, this ancient hotel of Calle Quintana was the birth house of a Spanish celebrity. It was the cradle of a man who became renown in Spain and as far as Russia. It was Agustin de Betancourt y Molina. This is no doubt one of important facts which speak for the historical importance of this Calle Quintana hotel. And, Agustin de Betancourt was one of most famous Tenerife natives and one of top celebrities of the Canary Islands and Spain who made history indeed. This historic hotel is also a true monument for an era gone by. It also has been a theater during almost 100 years. An absolute dream of a perfect colonial indoor patio. 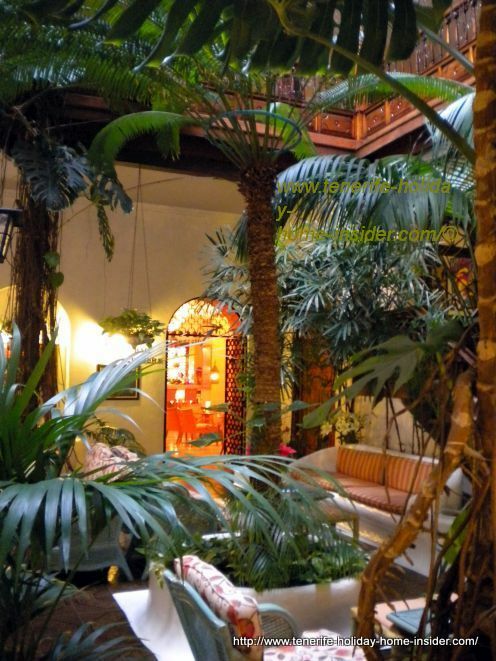 Admire Hotel Monopol's tropical patio indoor yard. It's a stunning architectural feature by its precious timber balconies of upper floors, alone. This lobby oozes perfection which wouldn't be easy to reproduce for a colonial setting. The exotic design of the sofas blends in perfectly with surroundings. Take a seat and gaze past eight meter tall palms to a unique, black and white skylight which covers an entire ceiling. There hardly is a better place for relaxing than in this hotel lobby. Wow, it's called a 5 star for the price of a 3 star. 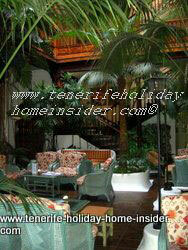 This city hotel has been endorsed as one of Tenerife 5 star hotels by many reviews. Reason for this are the immaculate 92 rooms, helpful staff and many delightful extras of the hotel. The rooms are not even big but, have ceiling fans, showers, television and comfortable beds. Discover the hotel's generous, sparkling swimming pool on one of its upper floors. There, let your eyes wander over terracotta tiled rooftops towards ocean, sky or an old venerable town. Enjoy peaceful parties at the historic hotel's games' room where chess tables are not amiss. 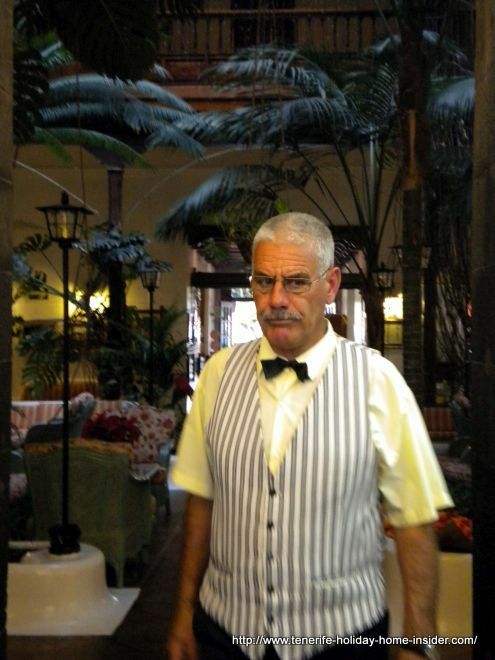 The owners of this historical hotel of close to 100 Puerto Cruz hotels where Hotel Monopol is part of seem to go the extra mile to please tourists. By the way, the Monopol Hotel has been family run for almost a century. Fresh Hawaiian flower heads of Hibiscus, Frangipani or Cannas are sprinkled daily by the steps of the hotel's entrance door. They are part of the establishment's motto which thrives to offer more than the usual welcome. Single not so perfect staff incident confirms the rule.